I write a fair number of long film and TV reviews on this blog, but it hasn’t been as common for me to give books the same treatment here due to the volunteering I do as a book reviewer who uses a pseudonym elsewhere on the web. By the time I’ve written those reviews, I’m generally in the mood to write other sorts of posts for my own site. Saturday Seven is a now-defunct blog hop I participated in. We talked about all sorts of bookish things on it, and I sorely miss it. Hopeful Science Fiction is a series I occasionally update here that is meant to highlight sci-fi/fantasy books that have uplifting messages. Today’s prompt is reminding me that I should keep this series going. It’s been a while since I added to it. This week’s list will include a few long book reviews, but it will also have round-up posts I did that included micro-reviews so that this post is a reasonable length. I really need to write more full-length book reviews for this site! 1. 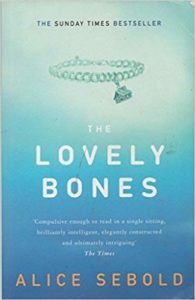 Hopeful Science Fiction: The Lovely Bones. I should warn you all that the opening scene in this book is about a young girl’s final moments on Earth, and she had violent end. The last thing I expected from such a terrible start was to see what happened to her after she went to the afterlife. 2. History Books About Ordinary People. This is still my favourite type of history to read about. Xenofiction is an awesome genre and we need more books about it. I’m quite excited that there’s going to be a movie made about The Art of Racing in the Rain! 4. 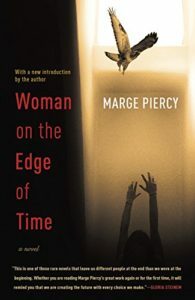 Hopeful Science Fiction: Woman on the Edge of Time. Woman on the Edge of Time is one of my all-time favourite sci-fi classics. I keep talking about it online in the hope that more people will discover it. 5. Cold and Flu Season Reads. I’m so glad that cold and flu season has ended. This was a round-up I did about fiction and non-fiction books about all sorts of respiratory illnesses. 6. What to Read When It’s Hot Outside. Now that those of us in the northern hemisphere are moving closer and closer to summer, I may have to reread some of these books. The Valley of Horses has been something I’ve reread the past few winters, and I still think it’s the best book Jean M. Auel ever wrote. Winter tends to be a difficult season for me for mental health reasons, so it’s crucial for me have some stuff to look forward to then. 8. My 4 Favourite Science Fiction Books About Life on Mars. Wow, I’d totally forgotten I wrote this post. Here’s hoping we all live long enough to see humans actually staying on Mars at least temporarily. 9. 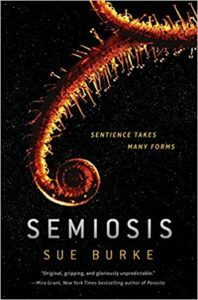 Hopeful Science Fiction: Semiosis. This was such a fabulous read. As you might have already noticed, I love stories about humans moving to other planets, and this was an excellent example of that type of tale. Earlier this year, I blogged about my to-watch list of science fiction and fantasy films. Since then, I’ve been periodically reviewing certain films that I enjoyed and thought you all might like, too. 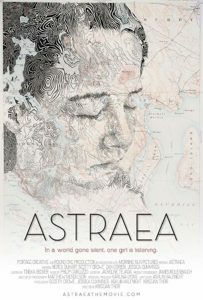 Previous instalments in this series include Into the Forest, Annihilation, Coco, Winchester, The Little Stranger, and Astraea. 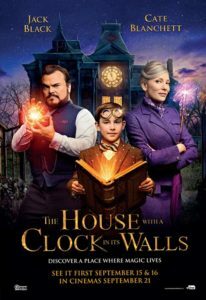 The House with a Clock in Its Walls is a 2018 American fantasy film based on John Bellairs 1973 novel by the same name. While it was written for a middle grade audience, I think adults would enjoy it, too. This story was set in New Zebedee, Michigan in 1955. A ten-year-old boy named Lewis was recently orphaned, so he was sent to Michigan to live with his uncle Jonathan. The interesting thing about Lewis and Jonathan was that they didn’t seem to have any sort of relationship before the opening scene of this film. It made me wonder why he’d been selected as Lewis’ guardian! There was a reason for that, but you’ll have to watch it to find out. While most of my aunts and uncles lived far away from the communities I grew up in, I did see all of them at least occasionally while growing up. I can’t imagine what it would have been like to go from not knowing a relative at all to being raised by them. 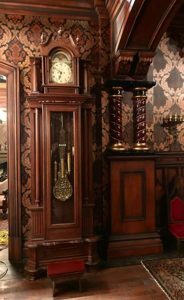 I liked the fact that the characters acknowledged how odd that transition was before diving into what Uncle Jonathan was capable of as a warlock and what was really going on in his magical, clock-filled home. There wasn’t one clock in Uncle Jonathan’s house, there were dozens – or maybe even hundreds – of them. The vast majority of them were perfectly ordinary and were only capable of telling you what time it was. Yet there was one magical clock hidden somewhere in the house that had the power to end the world. If Jonathan couldn’t find it soon, the bad guy might beat him to it. 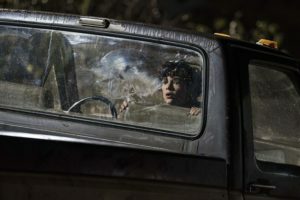 Owen Vaccaro as Lewis Barnavelt. Lewis, the protagonist, was a bookish and intelligent 10-year-old boy whose parents had recently been killed in an automobile accident. He was sent to live with his uncle after their deaths. 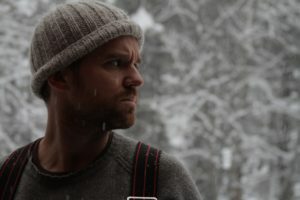 Jonathan, a quirky bachelor, was Lewis’ uncle and guardian. He worked as a warlock and was quite good at his profession. While he had good intentions when he took in his nephew, he knew absolutely nothing about raising children. Some of the funniest scenes in this film showed what happens when someone who doesn’t understand anything about children attempts to parent one. Florence was an old and dear friend of Jonathan’s who lived next door to the Barnavelts. She was sensitive, caring, and by far the most intelligent character in this tale. I’d love to see a spin-off about her someday. Isaac was the antagonist in this story, but I can’t share anything about his backstory without giving away spoilers. Like Florence and Jonathan, he had developed the ability to perform various types of magic. Mrs. Hatchett was the nosy, grumpy neighbour who spent a great deal of her time spying on the Barnavelts and complaining about all of the strange things that can happen when one lives in a magical household. One of the many clocks in Jonathan’s home. I loved the humour of this film. Yes, it was written for a preteen audience, so there were the obligatory bowel movement and other body fluid jokes you’d expect for this age group. There were other scenes that were clearly written for adult viewers, though, and I don’t mean that in an x-rated sort of way at all. Instead, the storytellers showed how easy it is to make mistakes when you have no parenting experience and have suddenly found yourself raising a grieving 10-year-old. That might not seem like good fodder for a joke, but it strangely was. I had so much compassion for Uncle Jonathan even while I laughed at his sometimes incredibly odd ideas about how a child of that age should be treated and how much influence they should have over stuff like what they eat for dinner or when they go to bed. 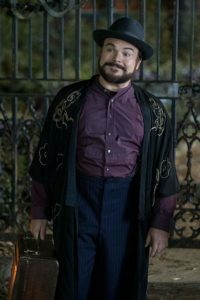 Jack Black’s goofy persona was the perfect fit for who Uncle Jonathan was, but I was also impressed with how this actor handled the more serious scenes Uncle Jonathan eventually experienced. He brought a lot of depth to a character that could have easily been written as nothing but fodder for comedy. This picture-perfect casting repeated itself with everyone else in this film. Every actor was well-suited for his or her role, including the supporting characters who didn’t necessarily have a lot of screen time but who still managed to make their roles memorable. I always enjoy finding films that pay such close attention to matching actors to the roles that they play. Be sure to pay close attention to what’s going on in the background of the scenes. Occasionally there are surprises lurking where you might least expect them, and I loved picking them out. While I know that this movie was based on something that was written in the 1970s and set in the 1950s, I was disappointed with the gender-based insults that wereso carelessly thrown around in it. There were several times when Uncle Jonathan made sexist comments that made me wince. They were supposed to be written in the context of him having playful banter with another character, but I don’t personally see anything amusing about using gender-based slurs as a retort. As much as I enjoyed the plot itself, these scenes dampened my urge to recommend it to others without warning them about it first. It would be one thing if those terms somehow played an important role in understanding the context of the storyline and the world in which it was set. I do not think that every potentially offensive reference should be edited out of classics when they are retold for modern audiences, but I do believe there’s something to be said for updating non-critical parts of a story that are understood in a completely different light now than when they were originally written. This was a case where those terms could have easily been been exchanged for non-sexist insults instead. 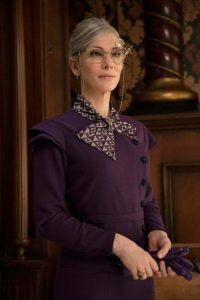 I like to end all of my reviews on a positive note, so the last thing I’ll say about The House with a Clock in Its Walls is that it was quite creative. It blended the wonders (and occasional frustrations) of childhood beautifully with the many references it included to more serious, adult topics like how to deal with grief or what it truly means to be a family. This is the sort of film that can be enjoyed by kids and grown-ups alike in my opinion. 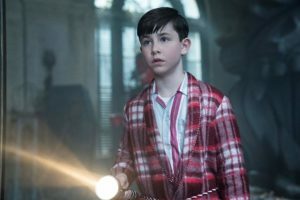 The House with a Clock in Its Walls is available on iTunes. Earlier this year, I blogged about my to-watch list of science fiction and fantasy films. Since then, I’ve been periodically reviewing certain films that I enjoyed and thought you all might like, too. Previous instalments in this series include Into the Forest, Annihilation, Coco, Winchester, and The Little Stranger. Content warning: death of a dog and death of a child. 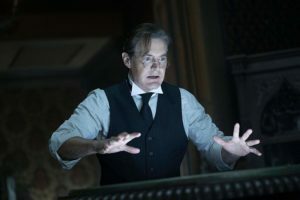 I will not be mentioning those portions of the story in my post today, and this will otherwise be a spoiler-free review. 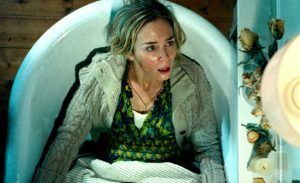 A Quiet Place is an American post-apocalyptic thriller that was released on March 9, 2018. It’s set in a near-future version of Earth in which sightless monsters have taken over the entire planet. Where these creatures came from is unknown, and their skin is so thick that it cannot be pierced by bullets. The only way to being detected by them is by remaining perfectly quiet twenty-four hours a day. The opening scene of this story happens 89 days after this apocalyptic event began, and it follows the Abbott family as they attempt to survive on their own. One of the children in this family has become ill, so they must travel into town to find medicine for him while avoiding all of the monsters who may be wandering nearby. Interestingly enough, there are very few characters in this film. The vast majority of humans and large animals have been killed by the monsters, so the Abbott family must rely on their own skills and common sense in order to survive without any hope of finding help elsewhere. I will be writing the character section in the present form. It’s a trick I discovered while working on a previous review, and I do it to avoid giving away any spoilers about the fates of the characters I write about. *Yes, I know I said I was done watching horror flicks. Let’s round that down to 98% done watching this genre since I keep finding (fairly) non-gory horror movies that tickle my fancy. Evelyn is Lee’s wife and the mother of their children. 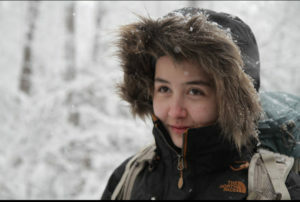 Her desire to protect her family is strong, and she expresses it in practical ways like making sure they have food, medical supplies, and clean clothing. She struggles with guilt over decisions she’s made in the past and anxiety about what will happen to her loved ones in the future. Lee is Evelyn’s husband and the father of their children. He is determined to find a way to reach out to other survivors and keep everyone safe, and he spends a great deal of time gathering as much information as he can about the monsters and their whereabouts. Sometimes this urge gets in the way of more urgent and practical needs, but he does always have the best of intentions. Regan is the oldest Abbot child. She is about twelve years old, quite intelligent, and has begun to question whether she should be listening to everything her parents tell her to do. Marcus, the Abbott’s middle child, is about eight years old. He shares his mother’s anxious personality and is reluctant to do anything that he perceives to be dangerous. Beau, the youngest Abbott, is a curious and imaginative four-year-old. As a preschooler, he’s too young to understand the danger everyone is in and relies on his parents and older siblings for guidance and protection. There are certain portions of the plot and character development that I have to leave out out of this review in order to avoid sharing spoilers with you. Needless to say, there is a lot more going on in the story than you might originally assume. Since I didn’t know anything about it when I first began watching it, I was pleasantly surprised by these plot twists. I hope you will be, too! One of the things I found most unusual about this tale was how little dialogue it had. The monsters had ultra-sensitive hearing, so even a quiet conversation would be noisy enough to draw their deadly attention. 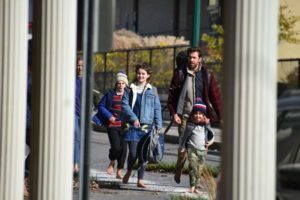 I was impressed by all of the non-verbal cues the filmmakers included in the script in order to keep the audience clued in to what was happening to the Abbott family. This is definitely something you’ll want to pay close attention to while watching. Multi-tasking is not a good idea here! So much information is shared with the audience through the characters’ body language, events happening in the background, or the strategic placement of certain items in specific scenes. While there were a small handful of scenes that briefly involved the sight of blood or serious injuries, this was not a gory film. 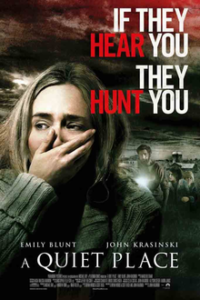 Nearly all of the horror elements involved the characters’ reactions to the unknown and how they’d had to adapt to a world where speaking or any other types of noise was enough to ensure your quick and certain death. The relationships between all five Abbotts were interesting. There were times when two or more of them had disagreements and had to convey those feelings primarily through any means other than speaking. This lead to some scenes that I thought were particularly well done, especially when it came to Regan’s desire to have more independence now that she was getting older. How do you parent a smart, willful kid who thinks she has everything figured out while living in an apocalypse? It definitely isn’t easy! I would have liked to see less foreshadowing, especially since not all of the foreshadowing actually turned out to be accurate. It was a little jarring to me as a viewer to get so many hints about how things might end only to find out that they were misleading. With that being said, this is still something I’d recommend to anyone who likes horror, survival flicks, or science fiction films about scary creatures. This premise of this story was solid. It would have been just fine with some foreshadowing and more time spent building up the tension as the Abbott family attempted to build a new life for themselves. By far my favourite part of this film was the ending. There were so many false starts along the way that I didn’t make any assumptions about how everything would turn out until the credits rolled. I loved the fact that the filmmakers kept us all guessing until the end. 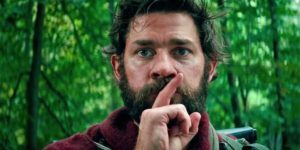 A Quiet Place is available on Netflix.